Great to see Gravity Rush 2 take the top spot, would the game hitting 100K WW by now be considered profitable ? No, fortunately it should have sold more than that. Unfortunately, it could still not be enough. Fortunately, pricedrops will come in the west. Count the digital and SIE-China publish the China version soon. It seems will surpass 10k here. More than America? Several (all?) 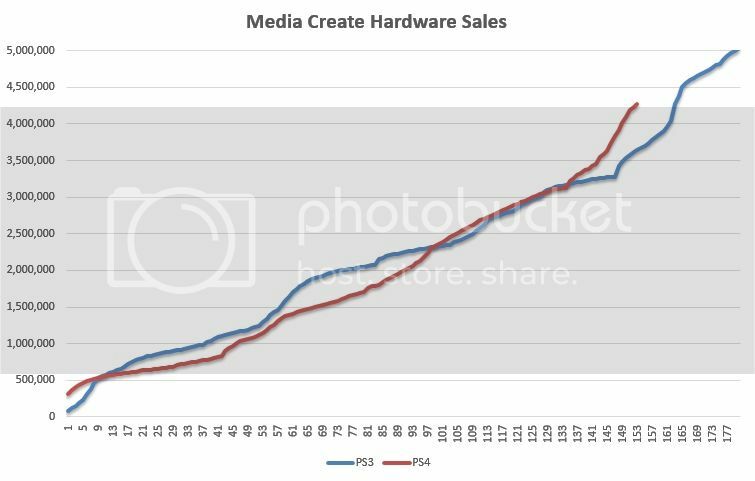 handheld franchises have declined in sales significantly when trying to transition from Vita to the bigger PS4 audience so it's still an accomplishment. I'm not usually huge on userbase comparisons, but when you're talking about <1 million in install base, it's a valid point, especially for a new IP. Out of all of Sony's handheld properties, GR is probably the one that made the most sense on a home console anyway. They're character action games, which have mainly been a home console genre. You know this is a first party game that's been in development for like 5 years, right? If the game indeed bombed in US & UK according to that poster then it's goodbye to the franchise I think. Was expecting about 50k for Yoshi, looks like I was slightly off. Also, lots of comparison to the Wii U version, but I'd say Yoshi's New Island (the other Yoshi game on Nintendo 3DS) makes for a more interesting comparison. It was goodbye regardless lol. Sega Japan: "Hey, we have this new SRPG with innovative mechanics and a neat setting. It's the best thing we made in ages, and it's doing pretty well both nationally and globally! The critical reception and word of mouth are fantastic. How should we follow that up?" Sega Japan: "Ok, here's what we do: let's put a compromised sequel on a handheld that is struggling globally with tacked-on forced replay and multiplayer mechanics, and change the well-received setting to a generic anime high-school! We might catch lightning in a bottle and get some of that Monster Hunter dosh." Sega Japan: "Hmm, for some completely unpredictable reason this didn't go so well. Failed hard outside Japan, and didn't really make more money here either. Let's try again with a slightly better setting, but still on the same platform and without a global release." Sega Japan: "That didn't work either." Sega Europe: "Hey we put that original well-received innovative SRPG on PC with a decent port by paying 3 people for a few months and sold like hot cakes! Insane profit margin." Sega Japan: "Wait, I think I got it. What we need is a JRPG which does away with the USPs that made the first Valkyria a global success, and we need to release it on PS3 and PS4." I obviously dont know the budget for the game, but judging by the size and production values i would say it needs at least yakuza type sales to be profitable. Even if it's a port, Woolly World absolutely can not sell lower than New Island. That's an injustice that can't be ignored. Gravity Rush 2 doing better than expected. Nothing special though. Valkyria is a big bomba but its apparently awful anyway so meh. Yoshi also not that great but maybe it will have legs? Also didn't Miitopia get like a 300k shipment or something? Guess we will see it hit the bargain bins big time soon. the budget of making the GR2 meowton ads might be higher than that lol. Now if you add marketing, localization, manufacturing, distribution and everything involved from the beginning of development to the game sitting on shelves you can probably guess that the overall cost for the game is way higher than only development costs. Also I'd hazard a guess saying GR2 took a bit more than 20 people working full time for 3 years. And let's not even talk about cost/opportunity there. Happy to see GD2 performing nicely. 35 is todays magic number. I dont know what expectations for GR2 were but those numbers seem good enough. I'm glad it's number 1, at least. 100k WW is very easy consider the digital version and it will do better in Asia cause Gravity Rush Remastered on PS+ here. I believe it will surpass 200k LTD. But consider this game's size, I think it need 250k to be profitable. Good news for MS. YOY XB1 has only dropped by 17 units. Bad news for MS. Same time last year it sold 52 units. Sega Japan: "Wait, I think I got it. What we need is a JRPG which does away with the USPs that made the first Valkyria a global success, and we need to release it on PSVita and PS4. And since we're at it we'll pay for the port to XB1 when we localise it for the West"
Corrected - there's no PS3 release. And there'll be a XB1 release for the West. Though since they kept harping on about Valkyria Chronicles 4 after announcing Valkyria Revolution and how that was during their phase of Japanese games for the Japanese makes me think they just wanted to recoup sunk cost before moving forward with a proper Chronicles title. At least in today's world I can safely say GR2 has been a yuge success. 1 million shipped on PS3. 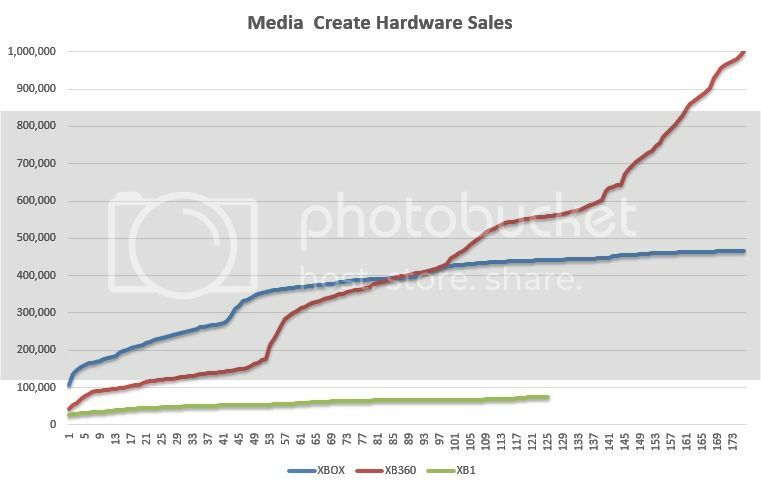 PC sales after some time nearing 1 million. By SEGA's standards that has to be a success, even if its just on the potential of the property. I'm sure it's by no means the only reason, but I'm still on DQ7! With regards to profit: has anything by Japan Studio done well recently? If not, does Sony mind? I don't think anyone will be asking for more Gravity Rush for a long while, but hopefully these numbers are enough to show Sony that games that are off the beaten track are worth creating. PS4 needs to average 27.808 to stay ahead to 5 million. I still can't believe xb360 made it to a million! Is it in humble bundle or discount a lot.? If your game's price is really low and people may buy it for collect cards. Yay for Gravity Rush 2 being number 2. Japan is clearly waiting for Scarpiah to save Xbox. Durante, you seem like a smart enough guy, so why post something so stupid? The original Valkyria Chronicles release on PS3 didn't do well. It famously was an initial bomb in the west that only had a long tail thanks to $20 clearance sales. That's why every subsequent game in the franchise seems to have been made with a smaller budget. VC3 and Azure weren't even developed internally. As for Azure's platforms, I don't know why that's really an issue. It's pretty clear some Japanese publishers view PC as a platform for library sales. That's understandable. PC is the second most price sensitive market in the industry. Launch Valkyria: Revolution at $50-$60 alongside the console/handheld SKUs and you're guaranteed to see stagnant five digit numbers on Steamspy for months. Launch the PC version at a lower price once the other SKUs stop selling and you might move more volume. Well, assuming the game isn't completely eviscerated in reviews and people don't just shun the game in general. Sega made a Vita SKU for Asia and a XB1 SKU for the west. I have no doubt there will be a PC one eventually. PS4 V3 is getting destroyed. Vita market still exists! It's valid but still an IP that barely sold before having some growth between entries (something extremely rare in the dedicated device Japanese market at the moment) and having a smooth transition from handheld to console saleswise is still a decent accomplishment IMO. Yes of course the PC price has gone very low but even initial uptake was notably good. VC1 remaster on PS4 happened for a reason as well. SEGA has seen potential in VC. The power of Lost Odyssey + Blue Dragon. A shame Microsoft didn't bother moneyhatting any exclusive JRPGs this gen. Gravity Rush 2 sold much better than what I thought (congrats, Sony! ), Yoshi slightly worse than what I expected, but still better than the original Wii U release. Slightly related...Holy hell, Comgnet seriously underestimated both Yoshi and GR. The former ended at 12pts at best, while the latter at 36pt. 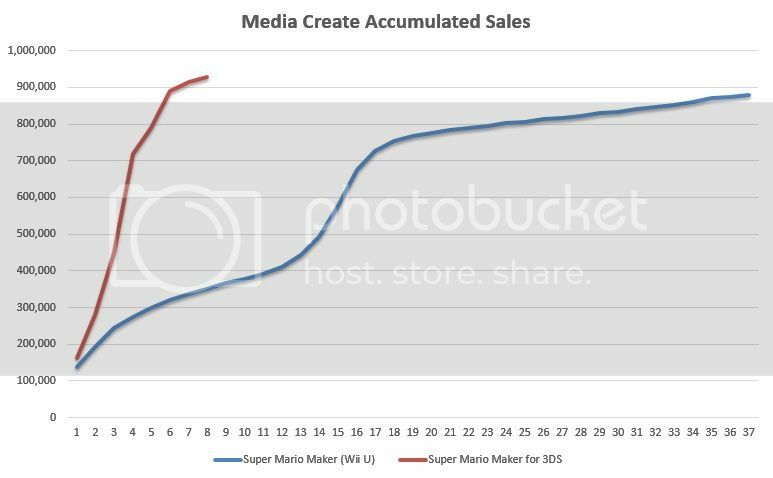 That's an insanely low pre-order points / thousands of actual sales, even for the former; Nintendo were among the games with the lowest ratios in the past, but never this low (except for Wii Party). Valkyria Revolution ended at 32pts (PS4) and 14pts (Vita), so slightly better than one, which is less insane. This makes me more hopeful for Nioh. Does that matter when outside of a PC/iOS/Android/PS5 port this is probably the last time we'll see the series lol? I find it pretty amusing that YW3 Sukiyaki is holding better than other games (even Pokémon), after how the original versions were overshipped. Why MS no more publish Mistwalker's games? It seems make mobile games now. 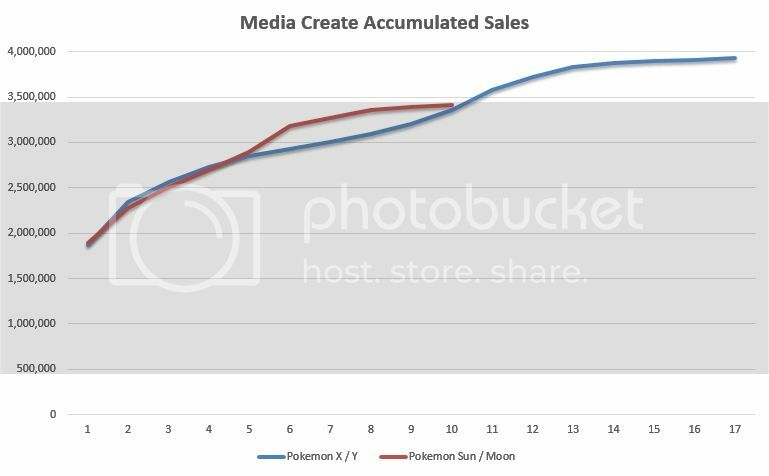 Digital sales more for Sun/Moon maybe? Look the Amazon.US and Amazon.uk, don't worry Nioh, and it may sell hundreds of thousands like BloodBorne in China. Does it matter for the future of the series (which I wasn't discussing)? Probably not though it doesn't really matter since they said this is the last game in the series before it came out. Does it matter when we are discussing how it has performed in Japan relative to the trends in the Japanese market (which I am doing)? Yes. Durante, you seem like a smart enough guy, so why post something so stupid? I don't think it's stupid, obviously. Even if VC was not initially a huge success everywhere, when you launch a new franchise you should also think about the critical reception of the franchise as well as word of mouth, and how that will develop as long term potential. The decisions made for VC2 were directly responsible for killing off that successful global franchise potential. As for Azure's platforms, I don't know why that's really an issue. It's pretty clear some Japanese publishers view PC as a platform for library sales. That's understandable. PC is the second most price sensitive market in the industry. Launch Valkyria: Revolution at $50-$60 alongside the console/handheld SKUs and you're guaranteed to see stagnant five digit numbers on Steamspy for months. The only really comparable same-date release is Tales of Zestiria. It didn't have the advantage of a game in the same franchise being extremely well received on Steam, but it reached 100k sales rather rapidly at full price, seemingly without affecting the sales of the console SKU in the west at all compared to previous entries in the franchise. It now sits at ~300k owners. 35 XB1's? I hope MS isn't planning on launching the Scorpio in Japan. I keep seeing this figure of 1 million for PS3 but I can't see how. Original Valkyria in Japan did something like 220k to 250k (in part thanks to budget re-release and anime) whilst in America it climbed upto 130k according to NPD leaks back in like 2010 or 2011. It wasn't anywhere close to a million by my reckoning unless it just kept selling in America. 1 million between the original, PC and PS4 port is more likely to me. And I was mainly talking about the sales of the original influencing the decision making of the series going forward, whilst the PC port has without a doubt proved there is a significant user base for the franchise in the West, Valkyria Revolution was an idea floating around and being planned for before the port was released. Infact the successive changes in gameplay makes me think upper management gave the greenlight because it was designed as an action rpg, after seeing the sales explosion of the ports made them change their tune. And for REVII. Maybe 250k? Btw I wanted to say it some weeks ago but I forgot I think. Sushi and Tempura prices are back to normal (they were sold for 2.980¥ by November). But since Sukiyaki was sold out, demand for these two versions increased and an it seems an additional shipment happened. Prices back to 4.980¥. Interested to see if Yoshi has any legs. Keeping an eye out.